These guys are brilliant. I first heard “Come On” while watching a morning music video show with some mates, and we thought it sounded pretty cool, but we didn’t catch the name of the song or band at that time. 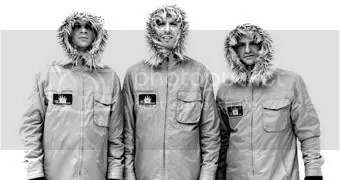 Later on, I had a voucher for some free tracks from Homebake, and there were these guys in parkas on the page, and I thought “Hey, I hope it’s that song!”. And it was. Anyway, enough of my inane ramblings. “Come On” has a cool guitar riff, uses some “oh-oh’s” to good effect, and pauses well in sections to build up a bit of intensity. The bridge is just awesome, and the drums roll along nicely. Listen to it. It’s one of my favourite new songs I’ve heard in ages, and I heard it a while ago. It still sounds amazing. Click here. Now. Go on. Do it. Now. Download some free music. 3 songs in fact. The other two are really good as well. I promise. MySpace page. Listen to other stuff. Picture found on MySpace page, cropped by myself, couldn’t find anyone to credit it to, sorry.